New this year, organizers have scheduled a series of events to spotlight gender, race and politics that coincide with the massive march — a packed weekend that organizers hope will re-energize Seattle’s activist spirit. Frustrated by America’s direction under Donald Trump or pervasive stories of sexual assault, a massive crowd is expected to parade through downtown Seattle on Saturday, Jan. 20, for a second annual Women’s March that organizers hope will spur new activism beyond the streets. Marking one year since Trump’s oath of office, organizers expect thousands of people advocating for civil rights, women’s rights, LGBTQ rights and other causes to gather at Capitol Hill’s Cal Anderson Park at 10 a.m., before marching to Seattle Center around 11:30 a.m., similar to last year’s record-breaking demonstration. Unlike 2017, the Seattle march this year is part of a series of conversations and events around gender, race and politics to spark new ideas and work throughout the weekend and city. Rally begins at 10 a.m.
March through downtown to Seattle Center begins at 11:30 a.m. It’s expected to take three to four hours. Organizers said the route will be accessible to people who use motorized and nonmotorized mobility vehicles, as well as strollers. Follow @seattledot and @kcmetrobus on Twitter for live updates on street closures and traffic. Meanwhile, a conservative, pro-Trump group known as Patriot Prayer is planning a counter rally “to promote freedom” during Saturday’s March, according to an online invite page for the event. Participants are encouraged to bring flags and wear distinctive clothing. The women’s marches are part of a global movement that grew from Trump’s election in 2016 and has become a cultural flashpoint for the rights of women to hold public office, earn equal pay and receive adequate health care, as examples, complicated recently by the nation’s reckoning over sexual harassment at work. 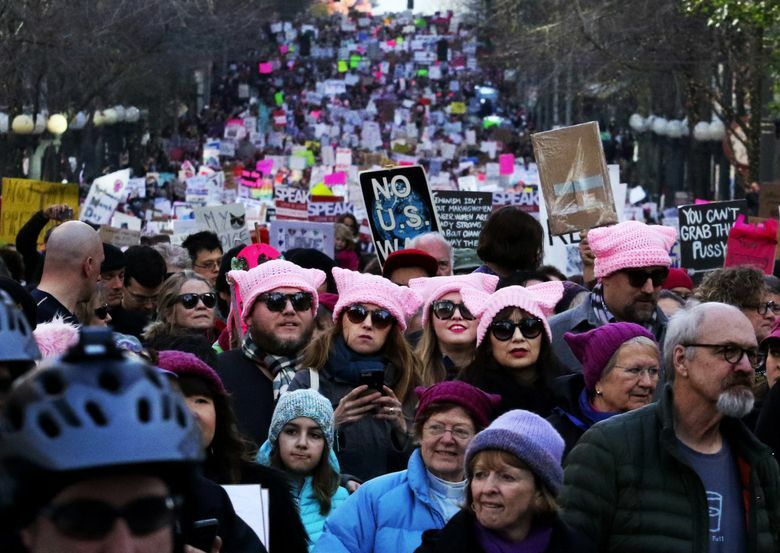 Beyond Seattle, crowds across the state, country and world will rally for similar causes Saturday and Sunday, too, expressing support for American women, as well as advocating for the rights of women in their respective countries. Progressives in Las Vegas will host a big event Sunday, Jan. 21, for example, with the goal of getting more people to vote. The Saturday march in Seattle, led by members of the Missing and Murdered Indigenous Women of Seattle, will last hours, heading west on Pike Street and north on Fourth Avenue before entering Seattle Center from Harrison Street, according to organizers. So far, more than 13,500 people on the Facebook event page have said they plan to attend. People who use motorized and nonmotorized mobility vehicles, as well as strollers, will have access to the route, organizers said. Sign-language interpreters will be available. Participants are encouraged to bring their children and families and use light rail for transportation to avoid parking and traffic headaches in the Capitol Hill and downtown areas. Charter buses will shuttle people from the Eastside. Numerous local social-justice and advocacy groups dedicated to homelessness, science, government transparency and other causes have signed on to the weekend’s mission. Organizers urge attendees to connect with representatives to continue their involvement. City Hall, for example, will host a panel discussion “centered on the experience and perspective of womxn in power, with an emphasis in the intersections of race and gender,” featuring elected officials such as Sen. Rebecca Saldaña, D-Seattle, and City Councilmembers M. Lorena González and Teresa Mosqueda from 10 a.m. to noon Sunday. Galen Erickson, 35, a “feminist guide to being better in relationships,” will lead a discussion about physical boundaries and consent. The Greenlake-based men’s coach said he has been overwhelmed with requests from men for help navigating relationships in recent months. “A lot of guys want to know what they can do, how they can do better,” Erickson said. As organizers planned the march, they said they reflected on lessons learned over the past year and past conversations to avoid the historical underrepresentation of minorities and foster a welcoming environment for everyone. About half the leaders of the Seattle march are women of color, according to Be The Change Network, a leading organizing group. The entire movement grew from a Facebook post shortly after Trump’s presidential win over Democratic presidential nominee Hillary Clinton, calling for a march on Washington, D.C., to counteract celebrations of the businessman’s inauguration. Hundreds of thousands of supporters filled the National Mall and surrounding area on Jan. 21, 2017, the day after Trump’s inauguration, while city streets elsewhere simultaneously filled with pink hats, picket signs and chants in solidarity. Seattle’s 2017 march from Judkins Park to downtown Seattle set the city’s record for the largest demonstration of any kind, with an estimated 100,000 to 122,000 attendees. “That day was one of the most important and nourishing days of my life,” said Sarah Evelyn Myhre, a University of Washington climate researcher who will be hosting a talk at The Riveter in Capitol Hill on Sunday afternoon, Jan. 21.